President Mnangagwa yesterday met officials from the Comprehensive Nuclear-Test-Ban Treaty Organisation (CTBTO) and ratified the Comprehensive Nuclear-Test-Ban Treaty, which outlaws nuclear test explosions. The President met with CTBTO executive secretary Dr Lassina Zerbo and his delegation at his Munhumutapa Offices in Harare. CTBTO is an international organisation that will be established upon the entry into force of the Comprehensive Nuclear-Test-Ban Treaty, a convention that outlaws nuclear test explosions. Its seat will be Vienna, Austria. The organisation will be tasked with verifying the ban on nuclear tests and will operate a worldwide monitoring system and may conduct on-site inspections. The Preparatory Commission for the CTBTO, and its Provisional Technical Secretariat, were established in 1997. In an interview after the meeting, President Mnangagwa said, "Dr Zerbo is here. He is here as the secretary-general. He should say how does he feel when Zimbabwe, now today, has deposited instruments of ratification to the United Nations after a period of 20 days. Ask him? Asked why the country had taken too long to do so, President Mnangagwa said: "It was because this day had not arrived. Now that it has arrived, and there as new dispensation and the environment is now different, we thought it is proper that Zimbabwe signs with those nations, 167 other nations who have ratified, who are against the proliferation of nuclear weapons which is destructive to mankind." Dr Zerbo said Zimbabwe is an important African country. "Zimbabwe is an important country in Africa. Mr President (Mnangagwa) said that it's after 20 years. The 20 years of thinking, 20 years of assessing the situation then coming the final day when Zimbabwe feels it's ready to comply with some international instruments after looking at all aspects of the consequences of signing and ratifying the treaty as such an important treaty like the Comprehensive Test-Ban Treaty. 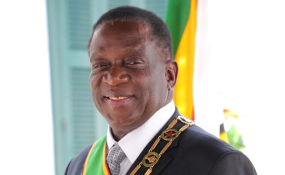 "Mr President mentioned that it's new time, new era, things are moving and Zimbabwe is showing to the international community that things are changing and Zimbabwe is seeking more assistance and more help from its peers in Africa and internationally to move forward," he said. Earlier on Dr Zerbo met Foreign Affairs and International Trade Minister Sibusiso Moyo. "We met with Minister Moyo in the context of nuclear test-ban treaty," he said. "We are to talk about the ratification process. Zimbabwe is one of the few countries remaining in terms of the ratification of the treaty. We are here to handle the process of ratification of Zimbabwe," he said. Dr Zerbo thanked President Mnangagwa for showing that Zimbabwe under the Second Republic was trying to be compliant to all the international instruments and the leadership in the region in that respect. Zimbabwe does not possess nuclear weapons. As a state party to the Nuclear Non-proliferation Treaty (NPT) since 1991, it is recognised as a Non-Nuclear Weapon State (NNWS).